Social media optimization is an effective strategy to increase your presence online with the help of social media sites and online communities. 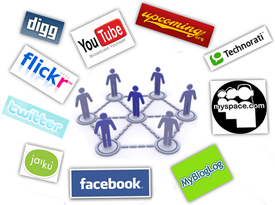 SMO services include various techniques like blogging, using images, videos and creating discussions online in order to keep in track with the audience. Social Media Marketing (Social Media Optimization, SMO) is the process of utilizing various social media networks like Facebook and Twitter in order to reach a larger audience. Social media marketing services focus on obtaining “followers” or users for each social media network in order to spread a marketing message across numerous networks. Social Media Optimization is the process of increasing the awareness of a product, brand or event by using a number of social media outlets and communities to generate viral publicity.